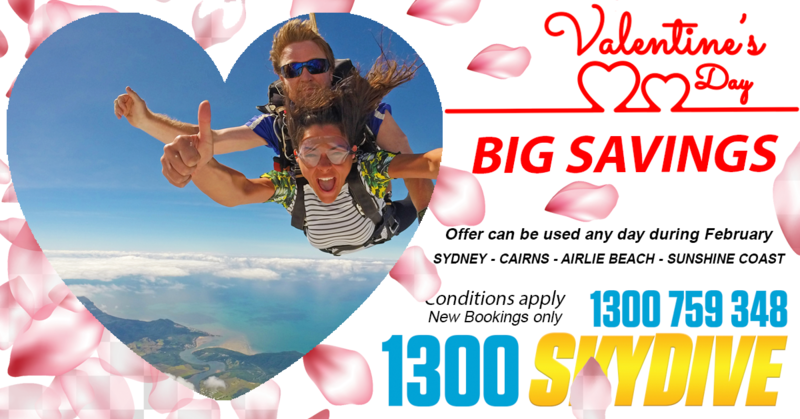 Tandem Skydive Special - Valentines. FREE transfers from Sydney CBD. Tandem Skydive any day during the month of February for the great price of $239 nothing extra to pay up to 14,000ft skydive. This includes free shuttle transfers from the Sydney CBD 7am and 11am daily. If you do not need transfers and are driving to the skydiving centre please choose our self drive Valentines special.